BMW to ‘update’ its iconic kidney grille! BMW has just released a teaser picture of their upcoming electric car, the i3X ahead of its launch at the Beijing Motor Show. The teaser picture reveals an updated grille of the car. The iconic kidney grille has been around for ages now and it is all set to change soon. It debuted in BMW 303 in 1933 and since then it has evolved to keep up with the pace of modern design. The elongated kidney grille became broader and shorter in height over the years. However, the vertical slat design element remained constant in the grille over the years. The electric cars from the brand like the i3 and the i8 have a solid black colour grille. This is because the electric motors do not need air to combust fuel and operate. However, even the grilles on these electric models were separated and were not joined. The latest teaser picture of the i3X shows how the future BMW cars may look like with the updated grille. 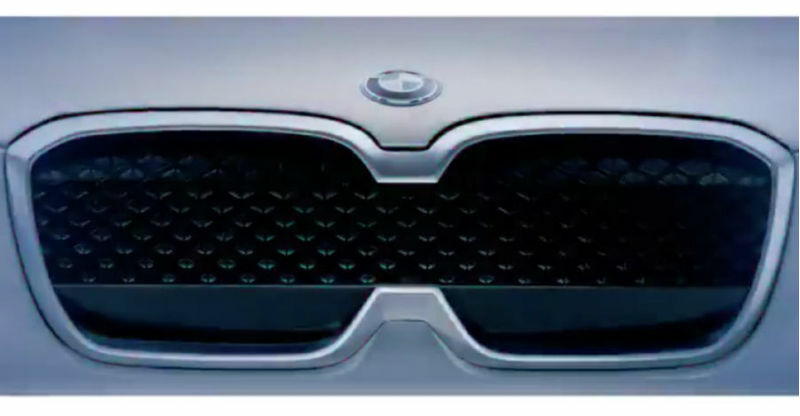 The teaser shows the new kidney grille that has an opening in the middle. The grille sports a very fine mesh-inspired design. However, the biggest change is the shape of the overall grille. This design may be exclusive for the electric cars of BMW as it will give a different identity to such cars. However, there is a possibility of seeing the updated grilles on regular cars from the brand too. The German brand has not said anything officially about the change but a formal announcement is expected at the Beijing Motor Show that will start from tomorrow. BMW will introduce the all-new fifth generation powertrain of electric cars with the unveiling of the i3X at the show. The car will take on the likes of Jaguar I-Pace and Audi E-Tron. « 2018 Maruti Suzuki Ertiga MPV: First official video out!